Asian Pears, Coconut, Figs, Granadilla, Mango, Papaya, Physalis, Pineapple, Pomegranate. 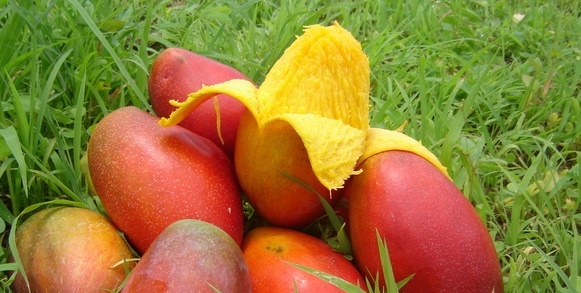 Despite the temptation to take a risk and try a new fruit, we opted to stick with the ever reliable mango. As it's been a few years since I last tried an actual mango (I don't think mango sorbet counts! ), the strong flavour was somewhat of a surprise. I accidentally revealed my amateur mango skills by being impressed when shown the "porcupine" technique to chopping the fruit. The fruit itself was delicious, and we easily munched our way through the medium sized fruit for dessert, especially as it was so sweet and flavourful. It was hard to believe it was a healthy dessert, since it tasted far nicer than plenty of other desserts (e.g. coffee cake, although that may be slightly subjective). Next time we end up with a mango, I've got a feeling a delicious mango sorbet is on the cards..!